One of the best adver­tising slogans I have ever heard was for a JBL loudspeaker (the JBL Sovereign II). The slogan? ‘If a JBL sounds expensive to you, there’s a reason: It’s expensive.’ That slogan was so good that even though it was first coined back in the 60s (which was when I first saw it in an advert), JBL has recently recycled the self-same slogan in some of its most recent advertisements. I am not sure if that slogan is quite so effective in the modem day, because whereas back in the 60s and 70s, JBL made some of the most expensive loudspeakers you could buy, a prime example being the JBL D44000, better known as the Paragon (Google it! ), these days JBL’s most expensive offerings are not even in the ball-park when it comes to high-priced loudspeakers. In fact they’re pos­itively budget-priced by comparison with the likes of the Kharma Grand Enigma or Wilson Audio’s WAMM Master Chronosonic. Thus it was that back in those days, the JBL L100 Century (known by one and all as the ‘Century’) became the best-selling loudspeaker in the world. Despite being sold as a ‘consumer’ speaker, the L100 Century was actually a version of the JBL 4310 Studio Monitor, but with LE20 tweeters. Or maybe JBL just figures that younger audiophiles might be interested in a speaker that looks—and sounds—different to any­thing they’ve ever experienced. 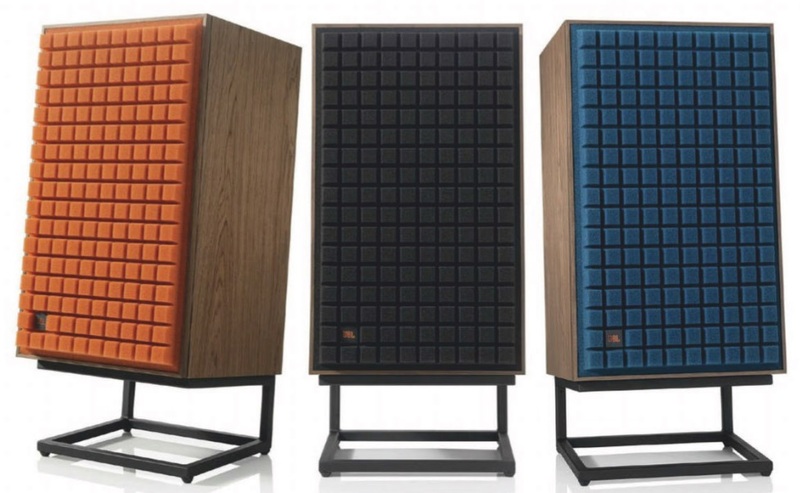 The reason for the similarity in external visual appearance between the old L100 and this new one is that JBL has used the same ‘Quadrex’ foam (in a choice of three colours—black, ‘burnt’ orange and dark blue) as a grille material. As you can see from the photograph above, the acoustic foam used to form the grille is cut so it looks a lot like a waffle. In fact, JBL was the first company in the world to use a grille like this, and it was all the work of one of JBL’s loyal employees, Carl Davis, whose day job at JBL was as a draughtsman. He wasn’t paid to do it. It wasn’t even his job. He spent nights on his own time perfecting the grille simply because he believed in it… and in the company. The JBL L100 Century’s head designer was Ed May. When he was brain-storming the appearance of the Century with Doug Warner (who would later become president of JBL) and Arnold Wolf, who at the time was JBL’s industrial design consultant, May happened to mention that since foam worked perfectly as an acoustically transparent material when used with microphones, it should also make an ideal material for a speaker grille. Wolf loved this idea, and came up with the ‘Quadrex’ grille design, but it turned out that the foam industry at the time was using a pressure cutting technique that was not up to meeting JBL’s design tolerances for the complex ‘V’ grooves required to form the waffle pattern. While JBL was pressuring (!) foam manu­facturers to come up with higher-tolerance cutting methods (during which it reportedly put the whole L100 project on hold) Carl Da­vis, who obviously knew about the grille prob­lem, was spending his nights and weekends trying to solve it. He eventually discovered that the particular foam being used could be accurately cut using high-tensile heated wire. I presume that if you set both controls at their ‘0dB’ position, you’ll get a pat on the back from Chris Hagen! driver that has a cast frame and a pure-pulp cone, and a 305mm diameter bass driver with a cream-coloured wood pulp cone. Measuring 637x390x372mm (HWD) the speaker has been designed so it can be operated vertically or horizontally. Obviously this size means it can be shelf-mounted, but if you’d prefer the speakers to be floor-standing, you can optionally purchase a small pair of black metal stands that elevate the speakers approximately 180mm from the floor, and tilt them backwards at an angle of around 15 degrees. If you choose to mount the L100s on shelves, you’d better make sure those shelves are very sturdy, because each L100 Classic cabinet weighs 27kg! Although it’s a sizeable 305mm in overall diameter, a dimension which includes the roll surround and basket frame edge, the Thiele/ Small diameter of the JBL L100 Classic’s bass driver is just 265mm, which gives an effective cone area (Sd) of 552cm2. The wood pulp cone is terminated by a rubber roll surround while the dustcap at the centre, as well as being unusual for its overly large diameter (106mm) is also unusual for being made from wood pulp rather than a synthetic material. The cone is ribbed, which improves the cone’s rigidity without increasing its mass. It’s worth noting here that JBL is not using pulp as a cone material in order to fit in with the ‘retro’ theme of the L100 Classic—wood pulp is an excellent driver material that is superior in many ways to the oft-used alternatives such as polypropylene and metal. It’s certainly not a question of cost—these days, paper cones are generally more expen­sive to manufacture than most synthetic and metal cones. The midrange driver (rated with an overall diameter of 125mm, but with a Thiele/Small diameter of 110mm) is made of polymer-coated wood pulp. It’s unusual for having a pleated fabric surround suspension. Again, this isn’t a nod to ‘retro’ sensibilities: pleated fabric surrounds are highly compli­ant, eliminate edge reflections and are far more environmentally robust than their modern-day equivalents, including rubbers and foams (most particularly foams, which famously disintegrate after prolonged expo­sure to ultraviolet light). The useable working life of pleated fabric and paper is far longer than any single owner will ever need. The tweeter is probably unusual for JBL because it’s a con­ventional 25mm dome tweeter rather than a high-compression horn driver—though the dome is made from titanium, is fitted with a waveguide and has its output increased by virtue of being positioned at the apex of a shallow horn. The bass reflex port on the front baffle is 85mm in diameter and 125mm long, with plastic flares at both ends to reduce the chanc­es of chuffing and other port noises. You’ve probably already noted the two most unusual inclusions on the front baffle, which are level controls that allow owners to separately adjust the output level of the midrange driver and the tweeter. No doubt these have been included as a nod to the retro theme, because they’re rare to find on any modern speaker. Most designers don’t like their customers ‘fiddling’ around with their perfectly crafted frequency responses so I presume that if you set both controls at their ‘0dB’ position, you’ll get a pat on the back from Chris Hagen! The multi-way gold-plated speaker termi­nals on the rear of the JBL L100 Classic are rather small and inset into a fairly small recess so it’s rather difficult to connect any type of speaker wires other than those with banana plugs. I was rather surprised to find only (+) and (-) terminals and not separate terminals to allow access to the ‘high’ and ‘low’ parts of the crossover. This means you can’t bi-wire or bi-amp the L100 Classics. I do have to remark on the appearance of the L1OOs, because their decidedly ‘retro’ look means they look nothing like any other speakers you’re likely to find for sale in stores. While I’m writing about the grille colour, I should mention the construction of the grille, which appears to be a direct copy of the original, because the sheet of Quadrex foam is attached to a rather large and heavy rectangular solid wood open-centred frame. There are no cross-struts at all, so there are zero obstructions for the drivers, though the frame is thick enough that I would expect some diffraction effects. The grille attaches to the front baffle via plastic pegs and peg-holes, and JBL has put the pegs on the front baffle and the holes on the grille. Since these pegs have a tendency to break if you continually remove and replace the grilles, I always prefer that the pegs be fixed to the grilles, rather than the baffle, but I guess that so long as you’re careful, you should be OK.
One problem with modern tall, narrow speakers is their tendency to tip over if given a gentle shove in pretty much any direction. The JBL L100s are far less easy to tip over, but because the small, tilted stand has a much smaller ‘footprint’ than the base of the speak­er itself, the speakers are not quite so stable (in the forward/backwards directions) as they might otherwise had been were they not on stands (or on stands with a larger footprint). The classic ‘JBL Sound’ is a truly ‘live’ sound, pretty much identical to what you hear at a rock concert… exciting, dynamic and vibrant concert… exciting, dynamic and vibrant. 1 think at least a part of the ‘JBL Sound’ is down to the very high efficiency of the driv­ers uses (JBL rates the efficiency of the L100 Classic design at a very high 90dBSPL) and/ or the way JBL builds those drivers, but very possibly it’s because the company is marrying a very large diameter bass driver with a rela­tively small-diameter midrange driver, where­as almost all other companies marry a smaller bass driver to that size midrange, or if they do use a 30cm bass driver, they match it to a larger-diameter midrange driver. If pushed I’d bet on the large bass driver/small midrange driver being the greatest contributor, because it’s the JBL models with this geometry that have the strongest ‘JBL’ sonic signature. On JBL’s more conventional designs the effect is lessened, sometimes to the point of being barely audible. both musicians are actually there in your room. Then, when Legge steps up to the mic and sings ‘I’ve been driving… down south’, the live performance effect is further intensified. The ‘JBL sound’ is also crisp and imme­diate. Listen to the intro to the title track Shadows on the Wall where all three musicians are playing shortened, syncopated notes and you can hear the JBL L100 Classics delivering the syncopation perfectly—the initial attacks are instantaneous and the ‘stops’ equally so, as both Legge and Ligtenberg damp their strings. Later on in this same track you can hear how deep the JBL L1OOs dig into the bass by listening to Ligtenberg’s bass and Oli’s kick drum—the bass goes all the way down. When the pace slows on Wave, I revelled in the lovely slide guitar sound that was perme­ating the air of my listening room courtesy of the JBL L100 Classics. Another album that sounded great through the JBL L100 Classics was Dylan’s ‘Planet Waves’, which I think was Dylan’s last great album (but note that I do not include ‘The Basement Tapes’ in my definition of the word ‘album’). If you haven’t heard this album it’s well worth searching out, because the sound is excellent and both Dylan and The Band are in fine form. Dylan’s harmonica work on this album is as good as I’ve ever heard him sound… maybe even better. On Dirge, which has only Dylan (singing and playing piano) and Robbie Robertson on acoustic guitar, the sound was breathtaking- ly real as it issued from the L100 Classics. If you skip the following track (you can, because Dylan would—he’s on record as saying it has ‘dummy lyrics’ you’ll hear Robertson really bringing it home on Never Say Goodbye. Indeed one of the things that make this album so great is that both Dy­lan and The Band really gel on it. They’re really, really tight without sounding rehearsed. Indeed it sounds as if they’re so relaxed they could be jamming just for the fun of it. And some of the songs are fabulous. Just listen to Going, Going, Gone, and to Tough Mama. The JBL L100 Classics delivered Dylan’s voice perfectly, as well as the piano tinkling away in the background. The JBL L100 Classics also sounded miraculously good delivering Eleanor McE- voy’s classic album ‘Love Must Be Tough’. The Jagger/Richards composition Moth­er’s Little Helper will give you a fantastic cross-section of sounds that the JBL L100 Classics excel in delivering, from McEvoy’s cleanly recorded voice, to Des Lacey’s drums and percussion, to Philip Myatt’s bass and of course there’s Peter Beckett’s various contributions on piano, organ, keyboards, and guitar. The arrangement (by Beckett) is so beautifully sparse you can hear how the L100 Classics deliver the sound of each instrument to perfection. When the sound fleshes out on the follow­ing Love Must Be Tough, co-incidentally my second-favorite song on the album with a lovely melody and great lyrics, the JBL L100 Classics again impressed with their ability to deliver the sonics perfectly. If I were to point out the single aspect of the sound you should pay the most attention to when you’re listening to the JBLs yourself, you may be surprised to hear that it’s not that classic ‘JBL Sound’… that will be self-evident. What you should listen for is the bass from the JBL L100 Classics. It’s the quality and depth and ‘sound’ of the bass that issues from the JBL L100 Clas­sics that will make you understand why someone invented the ’12-inch’ woofer in the first place and why JBL uses it on the L100 Classic and on so many other of its designs. The bass from a ’12-incher’ sounds so much more real and impactful (if that’s even really a word) than the bass from a 10-inch driver or a pair of 10-inch drivers, or any combination of differently-sized bass drivers you can think of. 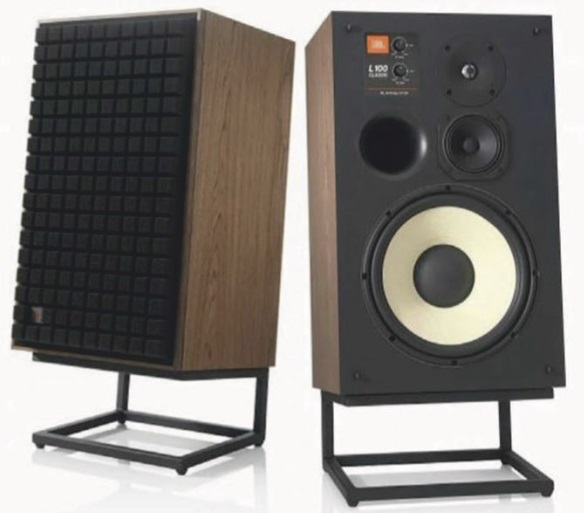 The other thing to think about if you’re comparing with another speaker is that the JBL L100 Classics can play unbelievably loud with­out sounding at all overloaded… much less distorted. They’ll continue to deliver clean, clear sound at volume levels that would have other speakers going up in smoke. The JBL L100 Classics are truly exciting speakers. They deliver music in a way that makes you want to do more than tap your foot in time to the beat… these are speakers that make you want to get up and dance, or rip out a lead break on your air guitar. large bass-reflex environment also means that it should not be a surprise. Indeed the opposite would apply: it would be surprising if the low-frequency response was not extended. The high-frequency response of the JBL L100 Classic is shown in much greater de­tail in Graph 2, a graph which addition­ally shows the response with the grille in place (red trace) and without it (black trace), when both level controls are set to 0dB. You can see that the grille doesn’t appear to be completely acoustically transparent, as it reduces the output fairly uniformly across the band by about 2dB, with a little more effect on the response between 3kHz and 4.5kHz. 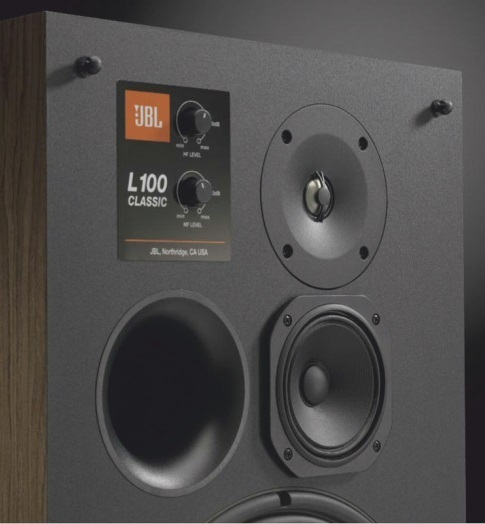 Because the re­sponse is attenuated by the same amount virtually irrespective of frequency, the JBL L100 Classic will sound the same without the grilles fitted, though the treble would be a little attenuated compared to the bass. 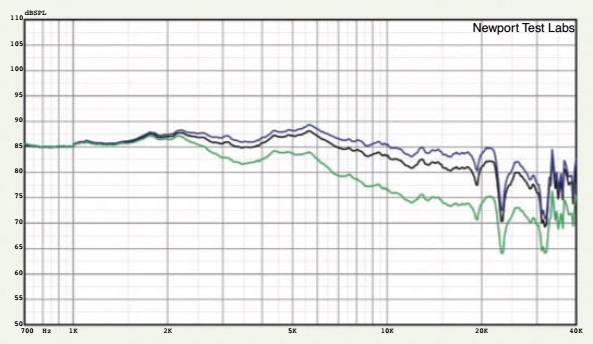 However, you could easily compen­sate for this effect by using the front baf­fle level controls to increase the level of the midrange and tweeter (see Graph 3). Newport Test Labs measured the low-frequency response of the JBL L100 Classics using a near-field technique that gives the response one would expect to measure in an anechoic chamber, and you can see that the bass driver is delivering excellent sound pressure levels to below 50Hz, and that the output from the bass reflex port cuts in to extend the response below this frequency. The port itself is very well-behaved, with very little output other than across its pass-band. The acoustic crossover between the bass driver and the midrange driver appears to be closer to 350Hz than JBL’s specified 450Hz, but the actual acoustic crossover is neat and seamless. Graph 1. Frequency response. 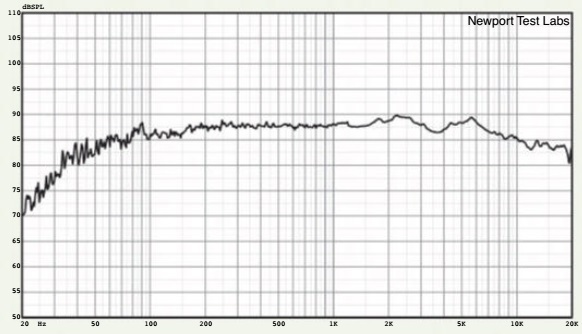 Trace below 1.2kHz is the averaged result of nine individ­ual frequency sweeps measured at three metres, with the central grid point on-axis with the tweeter using pink noise test stimulus with capture unsmoothed. This has been manually spliced (at1.2kHz) to the gated high-frequency response, an expanded view of which is shown in Graph 2. Graph 2. High-frequency response, expanded view showing response without grille (black trace) and with grille fitted (red trace). Test stimulus gated sine. Microphone placed at three metres on-axis with dome tweeter. Lower measurement limit 700Hz. Graph 3. 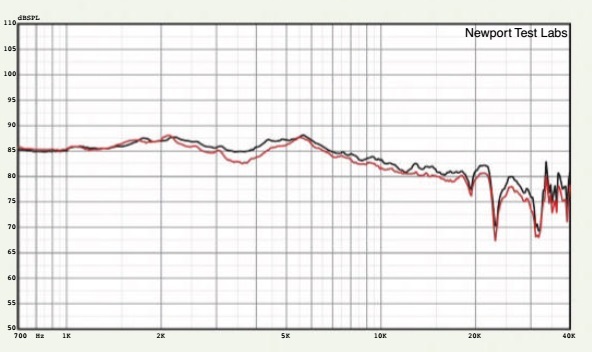 High-frequency response, expanded view showing effect of treble level con­trol. Max (blue trace); 0dB (black trace) and Min (green trace). Test stimulus gated sine. Microphone placed at three metres on-axis with dome tweeter. Lower measurement limit 700Hz. Graph 4. 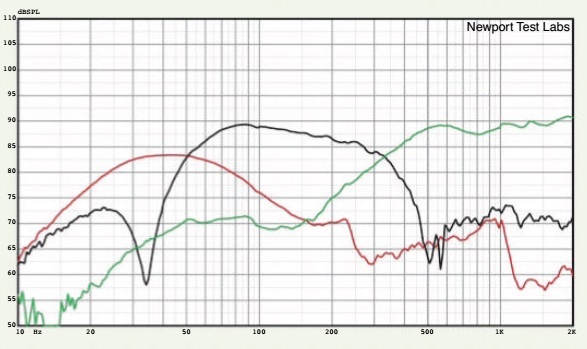 Low frequency response of front-firing bass reflex port (red trace), woofer (black trace) and midrange driver (green trace). Nearfield acquisition. Port/woofer levels not compensated for differences in radiating areas. Graph 5. Impedance modulus of showing impedance with both level controls set to Max (green trace), 0dB (black trace) and Min (blue trace). Graph 6. Averaged in-room frequency response using pink noise test stimulus with capture unsmoothed. Trace is the averaged result of nine individual frequency sweeps measured at three metres, with the central grid point on-axis with the tweeter. JBL specifies the L100 Classic as being nominally a 4ohm design, and Newport Test Labs’ measurements of it bear that out, though they also show that it will be nom­inally 4ohm only if you set the level controls at 0dB or higher. If you choose to set the level controls below the 0dB mark, the impedance dips to 3ohm at 550Hz, to 2.5ohm at 2kHz and to 2.4ohm at 4.6kHz. Given that the frequency response is the ‘best’ at 0dB and higher, there should be no good reason to set the level controls any lower. The ‘saddle’ between the two low frequency resonance peaks (at 18Hz and 54Hz) is at 35Hz, which shows that you can expect good bass down to this frequency, but not much below it. 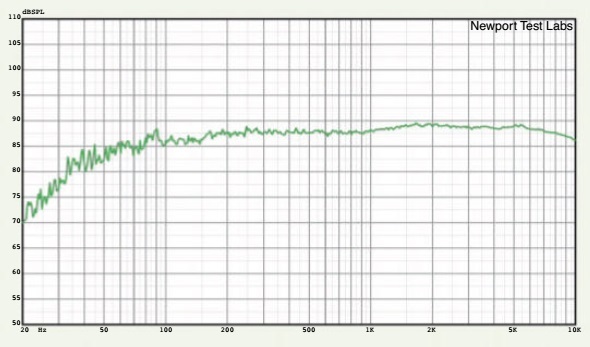 Since JBL itself specifies 40Hz, this would appear to be a ‘better than spec’ result. The rising impedance above 20kHz means the speaker will be ‘amplifier-friendly’ not only with conventional Class-A/B amplifiers, but also with Class-D amplifiers… even poorly designed Class-D amplifiers. 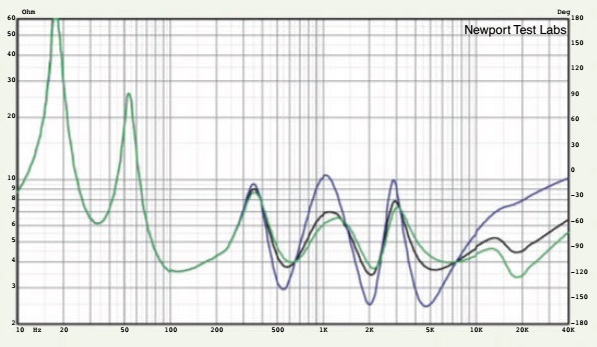 The room response of the L100 Classic is shown in Graph 6 and you can see that it’s ex­ceptionally smooth and extended, essentially extending from 50Hz to the upper graphing limit (10kHz) within a ±3dB envelope. Newport Test Labs measured the JBL L100 Classic’s sensitivity as 90dBSPL at one metre, using a 2.83Veq input, which is not only ex- actly as claimed by JBL, but also an excellent result in its own right, which means that you will be maximising the performance of any amplifier you connect to it. You’d expect JBL’s engineers to know what they’re doing, and it’s very obvious from the performance returned by the L100 Classic in Newport Test Labs’ tests that they do. Jim Barthell, who was VP of Engineering Adminis­tration at JBL at the time and directed the original L100 Century development program, thinks JBL’s best-ever marketing slogan was ‘Wednesday for Trombones, Thursday for Drums,’ a slogan I never did quite understand.